It’s a birthday cake…it’s a cheesecake…it’s…what is it??? Well, it’s a Persian Layered Rice Pilaf and I’ve had my eyes on this recipe for over a year now. I finally had the occasion to make it last weekend and I’m happy to say it was a success. The cookbook I found it in had no photograph, but the description sounded so lovely that I had to try it. It is a very unusual dish and I guarantee your guests will be intrigued and more than a little bit impressed! You could pile each of the pilafs individually on a large platter or layer them, like I did and then sprinkle them with chopped pistachios. It makes a beautiful accompaniment to grilled or roasted meats, or kabobs. The recipe comes from Mollie Katzen’s, Vegetable Heaven. Rinse the rice in cold running water until the water runs clear. Add the rice, water and salt to a large pot and bring to a boil. Turn heat to simmer. Cover and cook for 15 minutes. Remove from the heat and fluff with a fork. The texture of the rice should be individual grains. Divide the rice into 3 and place in individual bowls. Cover to keep warm. Heat the olive oil in a small skillet. Add the onion and cook until it is soft. Lower the heat and add the salt, garlic and dissolved saffron, and cook for 5 minutes longer over low heat. Remove from heat and stir in the parsley and green onions. Heat the olive oil in a medium skillet. Add the garlic and sauté for about 10 seconds over low heat. Add the carrots, cumin, salt and orange juice and cook for about another 10 minutes until the carrots are tender. Remove from heat and stir in the raisins and some fresh ground pepper. Heat the olive oil in a small skillet. Add the garlic and cook over low heat for about 10 seconds. Don’t let it turn colour or it will become bitter. Add the beets and salt and sauté for about another 5 minutes longer. Remove from the and stir in the dill, vinegar, honey and a little black pepper. Stir one mixture into each bowl of rice. At this point you can arrange the three pilafs on a large platter and top with pistachio nuts or make a molded dish like I did. I used a spring form pan and pressed each layer in firmly. To serve, cover tightly with foil wrap and reheat at 350 for about 30 minutes. Unmold onto a large serving platter and top with pistachios. Roast Chicken with Dates, Olives, and Capers from Ottolenghi’s website and it worked beautifully! Wow!!! SO creative and what a great photo! Thanks Jacqui! Glad you like it! Thanks Geraldine! I’m glad you like the pilaf! This is beautiful!! I bet the flavors are amazing together. Such a colorful dish. Persian food is something I don’t get to have nearly enough, I think I’ll have to try this one day! Hey, thanks so much for the comment! Yes, Persian food is a real treat when I get to have it too. I hope you get a chance to make this one day. Cheers! Colourful and appetizing indeed. I would love to taste this rice. It looks wonderful! Hey Liz, glad you think it looks appetizing…I wasn’t really sure I was going to post this recipe, but it came off OK. Maybe you can make it for a special occasion over the holiday season…a few of those coming up in the next few months. Have a good Thanksgiving! This is a gorgeous looking (and can’t wait to taste) rice dish!! Besides the Ottolenghi recommendation for main dish, I’m going to serve it with a chicken tajine! Awesome! Thanks so much for taking the time to comment. It would be fabulous with a chicken tagine! I hope you enjoy it! Well, thank-you so much. Glad you enjoyed the photos. I really appreciate that you took the time to make a comment. Have a lovely week! Looks so pretty and so delicious too! I love Persian food! 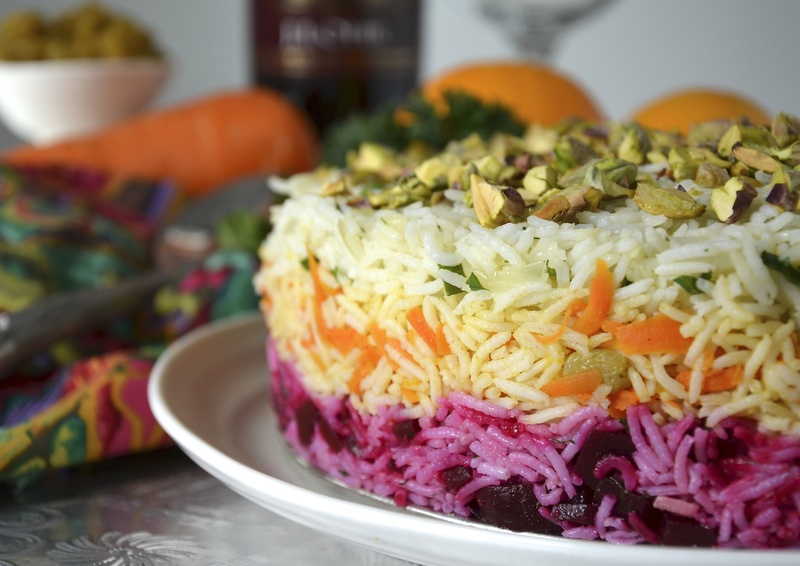 This layered rice pilaf from foodieonboard.com looks different and delicious! Must try it sometime.